It’s time to sum up my first week to becoming healthy. I have tracked my weight each day. Now weight isn’t the only factor into telling if you are changing. The scale can lie. Weight can easily fluctuate each day. Still, I am doing it every day to help me track trends. I have also taken body measurements to track that over time. I plan on updating those monthly. I have also been taking pictures. Selfie’s each day, and body pictures each week. By this time next year, I hope to have a really cool video of it all. This week, I started at 367.6lbs. This morning I weighed in at 352.2lbs. 15.4 pounds lost this week! Now of course, a lot of that is probably water weight etc. Still, it’s a great start. I also got some blood work done. Just the A1c test. Looks like I am still higher then I need to be. 6.2% and it should be <=5.6%. I want to email my doctor about my diabetes medication. I do my blood sugar testing twice a day, and a few recent ones are getting low. Tracking in MyFitnessPal, it looks like I was pretty close to were I want to be most days for fats and protein. Overall it felt like a great week. I did have one day where I felt a bit more hungry, so I ate a little more. I freaked out a little on 1/6 because I ordered a sub in a tub, which had higher carbs then I wanted. Still, I worked it out. I have also been getting lots more water in now as well. Calories mostly on the lower side, but I am feeling OK. Once I start getting more exercise into my routine, I will worry more about calories being on point as well. 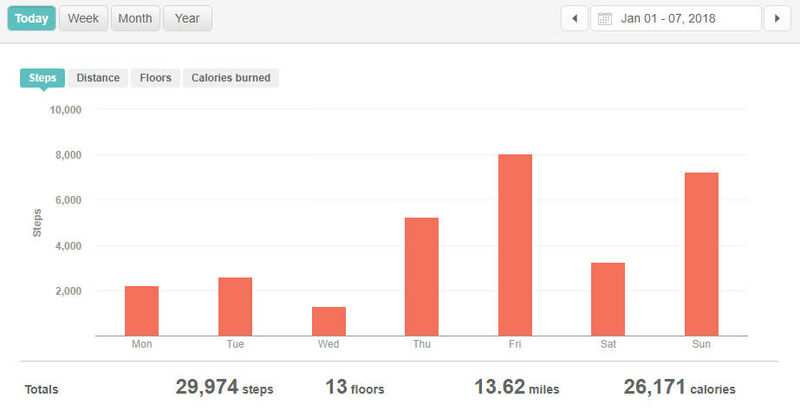 My exercise goal this week was to get out walking 3 times this week. I did accomplish that. Tracking on the Endomondo app for my phone, and Steps tracked via Fitbit Blaze. I hope to improve a bit each week. Eventually getting back to 10,000 step days. I think my sleep routine is working. Computer is off at 11:30 pm, then I read until 12:25 am. That gives me time to get into bed, right around 12:30 am. All nights were good except 1/1 since it was New Years, and I was getting ready to start this whole thing. So far today, I’m back at it. Got up, took my weekly pictures, weighed myself, and got myself to Costco. Did not walk as it was raining fairly heavy, and my Fitbit needed charge. Cooked up some chicken breasts, which my son immediately at two of them again. Found time to post over at my Nerd Fitness Challenge Thread, and wrote up this blog post. Tonight my Monday night bowling league is back from Christmas and New Years break. It will be late, but going to get out for a walk when I get home!